The gentle sunshine is waking up my little grey cells. I want light, I want bright, and I want inspiration. Hello Saatchi Gallery. The Saatchi suits spring more than any other gallery in London. Even without windows the gallery spaces remain wide open and uplifting, oh and they have some art in them to. So to share the Spring love, I thought we would have a mini art adventure, three days of works hunted from the Saatchi Gallery. 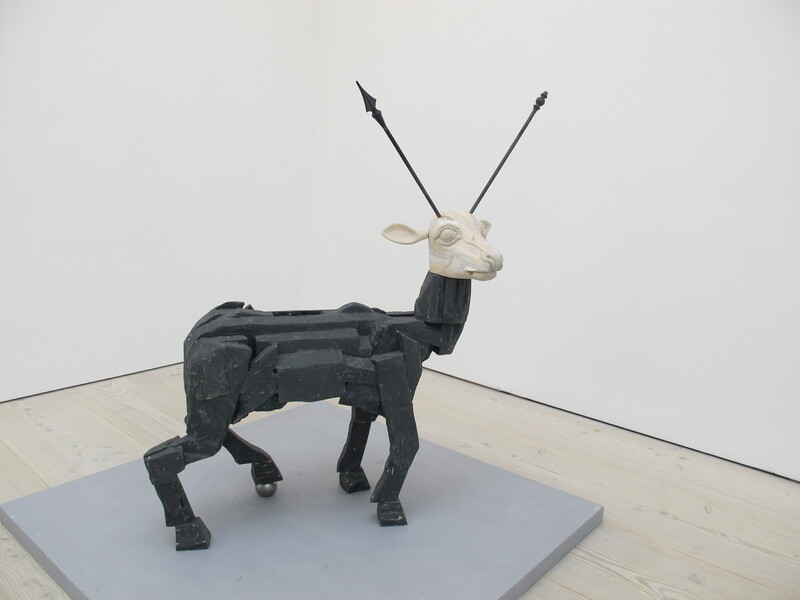 Starting today with Wounded Deer (2012) by Gosha Ostretsov, above. Apart from the very clever placement of the iron arrow, my favourite part of the sculpture is the silver ball underneath its hoof. Is it about to trip? Is it about to score a winning goal? Is it representative of the millions who worship it as a god and who it eventually intends to crush? The head was temptingly touchable. It reminded me of some of the classic Roman marble sculptures, with a texture that calls out for fingertips. One of the things that entertains me in galleries is imagining the art in another context. I could perfectly see the Wounded Deer left amongst the wildlife in Richmond Park, with creepers slowly chaining it to the ground.